The phrase “Content is King” in internet marketing has been bandied around forever. 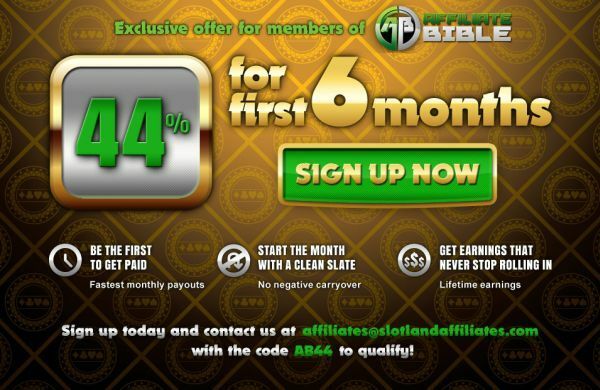 It’s always applied to the world of internet marketing, but more so than ever these days content is incredibly important if you want to succeed and make money online. The search engines, particularly Google, are practically telling us: they want to rank websites that offer the best possible content for the end-user. Ideally, whatever search term a user uses, they will be able to find the answer to their query either on the Google search results page, or via the very first prominent link that Google offers. Now whether or not that is truly the case with their current algorithm is up for debate – but it is essentially something that Google is striving after. And we, as the people who make money off search engines and search engine traffic, need to react to that and provide the best quality content for the user. Now what is quality content? Well first of all quality content is content that serves its purpose for the user. If the user is looking for the rules to craps and find your website, your page should explain the rules of craps to them thoroughly, without them having to look elsewhere. If a user is looking for the NBA Series odds, then your website should be listing the odds from a variety of sportsbooks. Of course, quality content should be a lot more than that. In the eyes of the search engines as well, the length of the content can be very important. Lengthy content can also result in better search results due to long-tail keywords. 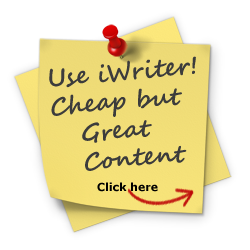 Of course, it can be hard to write lengthy content for some topics, and I see a lot of writers struggle with it. I mean, there’s only so much you can say about one topic, right? I want to let you know about a technique I use when it comes to writing content. This technique I find is very handy when it comes to writing content in bulk. If I’m writing content for a new website I will usually have 50 articles written before I launch the website. This is a LOT of writing, and can be tiring. I Write “To The Point” Content and Revisit It Later. “To The Point” content is where you don’t worry about calls to actions, conversions, article length etc – you pick a topic and you just cover it to the point that a user would be satisfied with it. You don’t prattle on and on for paragraphs just to hopefully extend your word count. When I write “To The Point” content I feel I can write a lot better. I’m not worried about the search engines or anything like that – I’m just focusing on getting to the core of the article without any BS, and hopefully providing the user with the results they are looking for. The content is a lot easier to write. Then I Revisit It Later. This is the most important part, and the technique I use to get the best out of my content. Most people focus solely on new content, but I think it is extremely important that you revisit existing content, and continue to better its quality. I use the free Epik Media Word Count Plugin for WordPress. How this works is rather simple – you install the plugin, and it presents a list of ALL of your content on the site. You can organize the content however you want. It lists the amount of words within each article. So when I see that, I can look at some of the low content articles(Which is quite a lot – yikes!) and then revisit them, and make them better. By doing this NOW, as opposed to when they were originally written, it allows me to be brainstorm more about the articles, and come at them with a fresh perspective. Right off the bat, I can do keyword research to enhance that article. If you’re doing a ton of keyword research at the beginning stage of a website the work can sometimes get sloppy – but now with a fresh perspective, I’m able to come up with many more keywords I can use to accommodate the visitor. On top of that, I’m able to look at my existing keywords, and see how I can incorporate those keywords into that particular article. By looking at it with this fresh perspective, it allows me to come up with so many more ideas for the content. 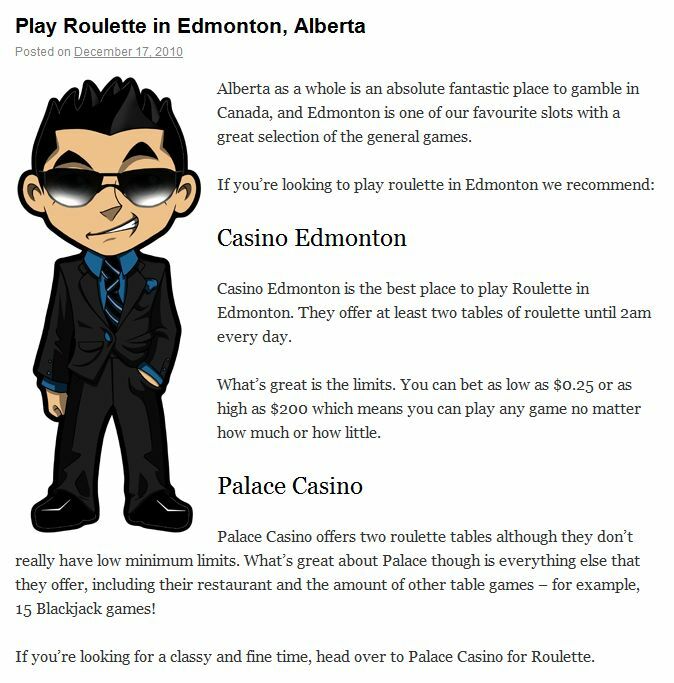 Right now, it’s to the point content – it lists two places in Edmonton where you can play roulette – Casino Edmonton and Palace Casino. Maybe there’s more places to play roulette that I am unaware of – so I can find out. And even if there isn’t, I could list other casinos and what they offer. I could also enhance the information about the existing casinos, add in pictures, directions, even places to stay. I can of course monetize the content by providing an online alternative, specifically tailored for Canadians or people in Edmonton. I could sell advertising to Edmonton based businesses on that page. I could offer specific marketing material outside the gambling market – ie: Edmonton Oilers Jerseys. I can repeat the content. This is a big one, but many people don’t understand how to use it correctly. They think that repeating existing content is a case of just taking what you have written and spinning it, to enhance the length of the content. Yet that isn’t beneficial from a user perspective. You can repeat the content in many ways. For example, I could repeat this content in the form of a question and answer section – which is a great way to get long-tail traffic, as so many people search in the form of a question. I could write “Does Casino Edmonton offer Roulette?” or “Where is Casino Edmonton located?”. Not only is this extending your content, but it’s presenting it in a manner that many users prefer. It also hits lots of long-tail traffic and provides a stronger impression of your primary keywords, which is a nice bonus. There are a wide variety of ways to duplicate content, but present it in a fresh format which the user will appreciate. Always bear that in mind. 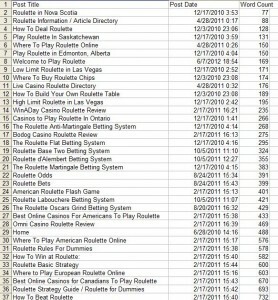 Even taking a 1500 word casino review and condensing it into a 10 item bullet list will be appreciated by your readers. I can go Above and Beyond. By this, I mean predicting what the users next steps would be. What you want to do is figure out exactly what the user is wanting to do AFTER they have read this content. Lets use a “Craps rules” article for example. Someone is searching for the rules to craps. What does that mean? Well, it means that they want to play Craps, and most likely they are unsure of how to play it. So you provide the rules to craps, and the user is happy. But then what? What’s the user going to do? Well the user is going to be PLAYING Craps. They might want to play it online or in a live casino – but they’re not reading the rules to craps just for shits and giggles. So you can enhance the user experience by offering additional content tailored to their future needs. You can either do that on the actual page, or by offering related posts. After a user has read the “rules to craps” you could provide them with further information like Craps Table Etiquette, or Craps Terminology. Point them to Craps Strategy Guides or of course, tell them where they can play Craps online; at online casinos that are PERFECT for the Craps newbie! 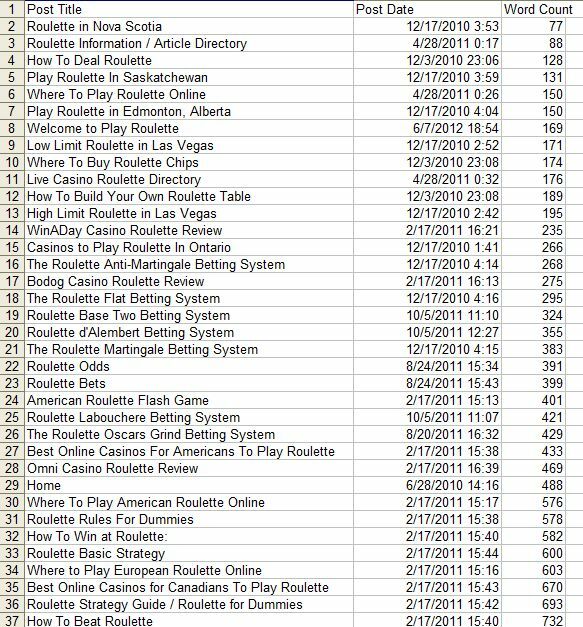 In regard to the Edmonton Roulette article, I can add in questions that would benefit the user for example “Does Palace Casino offer a Restaurant Buffet?”. I can even go further with that – what if I analyzed all the IP addresses of the visitors to that page? And what if some of them were OUTSIDE of Edmonton? Well that may suggest they are going to visit, so I could even offer content on the cheapest flights, or where to stay near the casino – that sort of thing. Yet in my initial writings of that article, I had none of this. The reason is simple: I was writing a lot of articles and I was getting tired of it. My creativity was at a minimum, and I felt jaded. That’s what can happen when you are writing a lot. That’s why instead I write “to the point” content, and over time slowly expand it, causing the content to get better and better and provide a much better user experience. If you’re struggling with writing, and finding it hard to get motivated, it could be that you’re trying to swing a home run every time. Start off with just a bunt, and work your way up to the Grand Slam. This article was written on June 20, 2012 however all articles are looked at on a monthly basis and updated to keep them relevant.